A more expressive rich graphic screen has been demanded in DCS (Distributed Control System) field according to a marked advance of the information technology and popularization of PC in recent years. Our new CENTUM VP Graphic system was fully reformed on the basis of the new concept of new operation style of CENTUM VP. Each of our former products has its own graphic system. But many features of those graphic systems can be shared among all products. CENTUM VP Graphic system integrate those common features and provide them as common modules in order to provide the same look & feel and operation. Also it is designed with very high flexibility and extensibility so that it will be reused by future products. The first stage in creating next-generation production control system that achieves innovative plant operation is providing "Visualized operation". "Visualized operation" for the customer means that he can reliably access and visualize plant data regardless of plant location and time. A core technology to be established for achieving this is HMI (Human Machine Interface) which is integrated irrespective of hardware and application platforms. 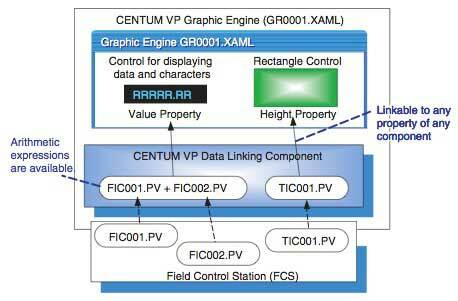 The CENTUM VP Graphic System is a key component of HMI in Yokogawa's distributed control systems (DCS). This graphic system uses advanced technologies to deliver flexibility, extensibility, high performance and high reliability. 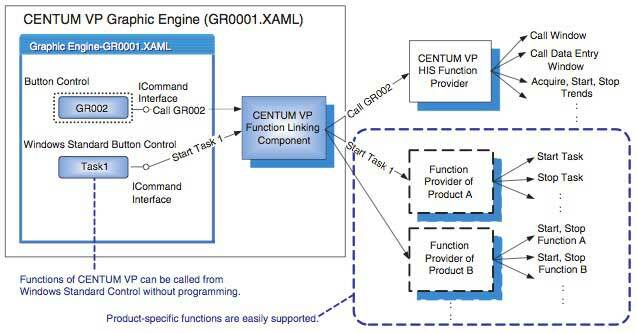 First, the architecture of the CENTUM VP software is described. Our CENTUM VP software architecture is a mechanism to integrate customer's plant information and function that is scattered. This architecture consists of three function groups and one infrastructure layer (Figure 1). Each function group is called a "Collaboration." 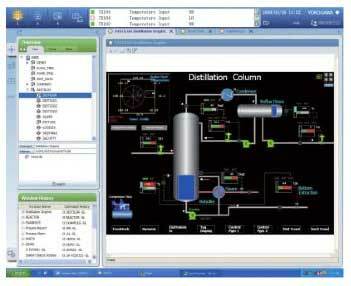 The View Collaboration consists of modules that support HMI. The Function Collaboration is the business logic layer consisting of features like workflows, KPI (Key Performance Indices) calculations etc. The Information collaboration is the information integration layer responsible for providing unified access to various information sources. These collaborations also share a common infrastructure layer that supports features like security, communication, name service etc. The architecture also is categorized into two parts: a common platform for different products, and a unique part for different products. Each of the Collaborations has common modules, as well as product-specific modules which are used only in a product. The infrastructure modules and the common modules in the Collaborations together are referred to as the CENTUM VP Platform. Products will be developed by providing product- specific modules on this platform. The CENTUM VP Graphic System naturally forms a part of View Collaboration, and was developed as a platform independent of products. Our integrated Production Control System CENTUM CS 3000 R3, Network-based Control System (NCS) STARDOM, and Plant Information Management System Exaquantum all have their own graphic systems with many common features and some product specific features. CENTUM VP Graphic System for HIS (Human Interface Station) particularly focuses on improving the productivity of operators, engineers, and supervisors without compromising compatibility, reliability, and performance. The architectural style for the CENTUM VP Graphic System is an improvement of the CENTUM CS 3000 Graphic System architecture, which could be formally called Abstract Data Repository (Figure 2). The Abstract Data Repository consists of Producers and Consumers of data in a common repository. Producers and Consumers are independent of each other and also the repository is accessed using abstract interface. 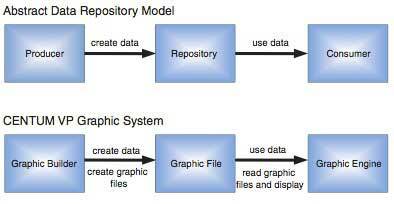 The Graphic File, Graphic Builder, and Graphic Engine of the CENTUM VP Graphic System correspond respectively to Repository, Producer, and Consumer of the Abstract Data Repository. 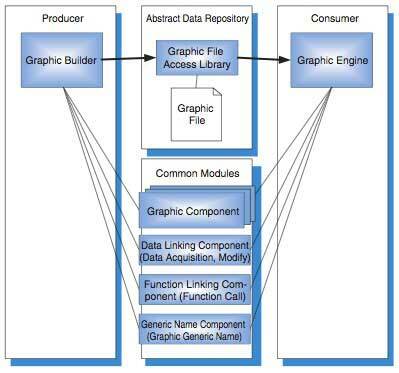 Functions such as graphic components, data acquisition, function call, and generic names of our former products were implemented in Graphic Builder or Graphic Engine as shown in Figure 3. However, with this architecture it is not easy to add and improve functions because of its lack of extensibility. The graphic components and other components of the CENTUM VP Graphic System were implemented as modules separately from Graphic Builder and Graphic Engine as shown in Figure 4. For this reason, Graphic Builder, Graphic Engine, and common modules need not be modified when introducing new graphic components. Graphic Component is displayed on a Graphic View on the operation and monitoring window. These components vary from simple components such as lines and rectangles, to complicated ones such as radar charts and process data display components. This module is used to design a Graphic View on the HIS operation and monitoring window using Graphic Components. The Graphic View can be saved as a Graphic File. This module provides core functions for drawing. It reads a Graphic File and loads Graphic Components. The Graphic Components are displayed in a Graphic View. Besides Graphic Components, a Graphic File also contains internal shared components which users cannot view. These shared components determine the behavior of a Graphic View. Such components are explained below. This component acquires the process values, etc. on the CENTUM VP Field Control Station (FCS), and changes the display modes and colors of Graphic Components (Modifier) (Figure 5). This component is independent from Graphic Builder and Graphic Engine and so the Modify Function can support third-party graphic components. This component retains the relation between Graphic Components such as button controls and their functions (Figure 6). The actual function is implemented in the product- specific module named Function Provider. By introducing this component, functions of CENTUM VP can be easily called from the Windows Standard Control such as a standard button control, through the ICommand Interface which is a Windows Standard Interface. This component specifies an alias of a tag name or item linked to a Graphic Component. The Graphic Component does not need to manage the alias because the Generic Name Component handles this task, which means that new graphic components can be easily added. Microsoft WPF (Windows Presentation Foundation) has been chosen as the implementation technology for the Graphic System. In addition, the CENTUM VP Graphic System uses the Microsoft XAML (Extensible Application Markup Language) as the graphic file format. Use subscription method (notify-on-change) for updating data instead of polling for all the data. Data acquisition and evaluation happens in background threads, freeing up the UI thread for user interaction. Additionally, WPF features also help improve performance. The CENTUM VP HIS Graphic System has been developed as a product based on the CENTUM VP Graphic System (Figure 7). Besides the modules of the CENTUM VP Graphic System as shown in Figure 4, DCS-specific functions are added for the release version of the CENTUM VP HIS Graphic System (Figure 7). For example, the CENTUM VP HIS Graphic Builder has integrates with the CENTUM VP Engineering environment. Figure 7 CENTUM VP HIS Graphic System DCS-specific modules have been developed to support functionalities such as Self Document and HIS Download. Integrating such modules into the CENTUM VP Graphic System, the CENTUM VP HIS Graphic System has developed as a commercial product. Similarly, the CENTUM VP HIS Graphic Engine integrates seamlessly with DCS-specific components such as Faceplate, Trend, and Message controls, and adds product-specific modules necessary for DCS, such as synchronized blinking and context menus. Figure 8 shows an example of the CENTUM VP HIS Screen. This paper has described our journey towards Integrated HMI, a core technology for Visualized Operation. Products featuring the CENTUM VP Graphic System platform will enter the market and contribute to operator productivity and engineering productivity. We believe that customers will gain additional benefits if third-party vendors integrate our Graphic System into their custom graphic components. 'VigilantPlant,' 'CENTUM,' and 'Exaquantum' are registered trademarks of Yokogawa Electric Corporation. 'CENTUM VP' is under patent pending. All other brand names, product names and titles and copyrights used in this paper are either trademarks or registered trademarks of their respective holders. 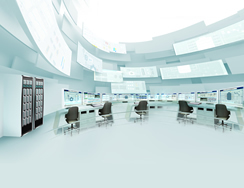 Our distributed control system (DCS) enables automation and control of industrial processes and enhanced business performance. Over 10,000 plants entrust Yokogawa DCS to deliver their production goals.